Meizu isn’t one of the big Chinese OEMs in the international market, but it’s got some fantastic devices with the flagship-like specifications at comparatively affordable prices we’ve come to expect from Chinese companies. Along with some truly unique features, certain Meizu smartphones easily stand out from the crowd. Here is a quick roundup of the best Meizu phones! There are three phones in Meizu’s 16 series. The first and best one is the 16 Plus, which comes with top-of-the-line specs like a Snapdragon 845 and up to 8GB of RAM. It also has a 6.5-inch display, a headphone jack, and an in-display fingerprint scanner. The second device goes by the name of Meizu 16 and is extremely similar to the Plus model. The main difference is its smaller display, with a diagonal of 6.0 inches. Other differences can be found in the battery and storage departments, which you can check out in the specs section below. The last of the three devices is the Meizu 16X, which packs a little less power under the hood, running on a Snapdragon 710 chipset with 6GB of RAM. The battery and screen sizes are the same as those of the Meizu 16, as are the rest of the specs and features including the in-display fingerprint scanner and headphone jack, among others. The Meizu 16 phones weren’t officially released in the U.S., but you can still get the international model of the Meizu 16 on Amazon for $640. 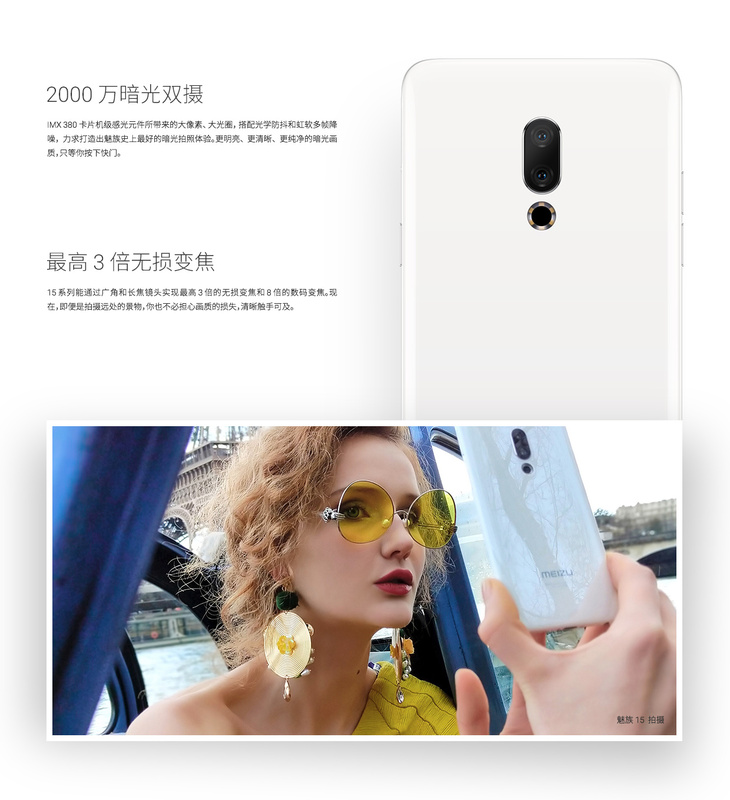 The other two models appear to only be available in select Asian markets for now, though you can still get the Plus model via the popular Chinese online retailer AliExpress — linked below. The predecessor to the 16 Plus was announced back in April and is powered by the Exynos 8895, the same chipset used by the Galaxy S8 series. Its 5.95-inch display has a 16:9 aspect ratio, surrounded by slightly thicker bezels than we’d like, which makes the device feel less modern than its successor. Nevertheless, it’s still one of the best Meizu phones you can get. The Meizu 15 Plus has a dual-camera setup on the back with 12 and 20MP sensors, one of which offers 3x optical zoom for those close-up shots. It also packs a 3,500mAh battery and has a headphone jack, which is slowly becoming a thing of the past on high-end Android phones. The device ships running the older Android Nougat. The Meizu 15 Plus was not officially released in the U.S., which means you’ll have to go the import route to get it. AliExpress sells it for $375. What makes both these Meizu phones stand out is the unique 1.9-inch secondary display found on the back that not only looks great, but proves quite useful at times. On the specs side of things, the Pro 7 comes with a 5.2-inch 1080p display, a Helio P25 processor, 4GB of RAM, 64GB of onboard storage, and a 3,000 mAh battery. On the other hand, the Pro 7 Plus earns its moniker by giving a bump to almost everything. The Pro 7 Plus features a 5.7-inch Quad HD screen, a Helio X30 processor, 6GB of RAM, 64GB or 128GB of onboard storage, and a 3,500mAh battery. Remaining the same between the two versions is the secondary display and the camera setup that includes dual 12MP rear cameras and a 16 MP front-facing shooter. Both smartphones also run Flyme 6-based on Android 7.1.1 Nougat. The Meizu Pro 7 Plus is priced at around $385, while the regular Pro 7 will set you back $315. Of course, if you are planning to buy these Meizu phones for use in markets other than China, check for network compatibility first. The X8 is the first Meizu phone with a notch. It’s not the most powerful device in the company’s lineup, as it packs the Snapdragon 710 chipset along with 4 or 6GB of RAM under the hood — more than enough power for the average user. Meizu X8's screen-to-body ratio is close to 90 percent. The Meizu X8 has a modern design with thin bezels and an 18.5:9 display that measures 6.2 inches. The screen-to-body ratio comes in at almost 90 percent. It sports a dual-camera setup on the back, a single 20MP shooter on the front, and has a headphone jack on board. Other specs and features include a 3,210mAh battery, a rear-mounted fingerprint scanner, and Android 8.0 Oreo. The phone is already available in select Asian markets but was not released in the U.S. AliExpress has it listed for around $270. The Note 8 was announced in October and falls into the mid-range sector. It sports a 6.0-inch Full HD+ display, the Snapdragon 632 chipset, and 4GB of RAM. It runs Android 8.0 Oreo with the company’s Flyme UI skin on top. The Meizu Note 8 doesn't sport a notch and has a headphone jack on board. The phone has thin bezels, which give it a modern look. It doesn’t feature a notch, which is a good thing for many. There’s also a headphone jack on board. The battery comes in at 3,600mAh, which is average based on the footprint of the device. There’s no expandable storage or IP rating for protection against water and dust. Other specs and features include a rear-mounted fingerprint scanner, a dual-camera setup on the back, and dual-SIM support. The phone has already launched in China, but there’s no word on its international release yet. It’s also available via AliExpress for $240. The last model on our list of the best Meizu phones is the E3. The device’s metal body and minimalistic design may not stand out, but it will appeal to many. Like a number of Sony phones, it has a side-mounted fingerprint scanner. The mid-ranger packs the Snapdragon 636 under the hood along with 6GB of RAM. It also comes with a 3,360mAh battery, two cameras at the back, and one at the front. There’s also a headphone jack on board. Unlike all the other Meizu phones on this list, the E3 supports expandable storage. The phone is already available in a few markets, with the U.S. not being one of them. Like with most Meizu phones, you’ll have to buy this one from a Chinese online retailer if you want it. AliExpress is selling it for $275. These are the best Meizu phones you can get your hands on in our opinion, although there are a few other great ones to choose from. Which Meizu phones would you add to the list? Let us know in the comments!